My certificate for working 132 references came today. I am pleased to reach this milestone. 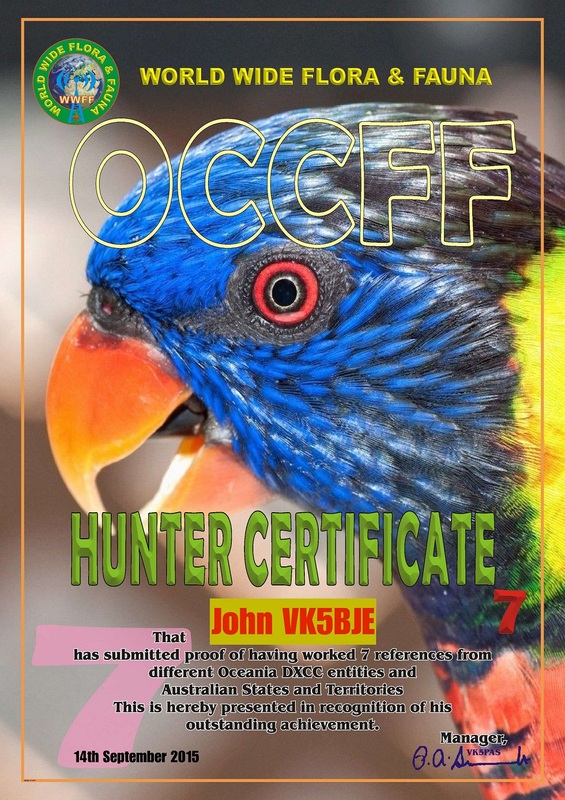 I was pleased to be awarded the OCCFF certificate for working seven DXCC entities, in my case all VK call areas. 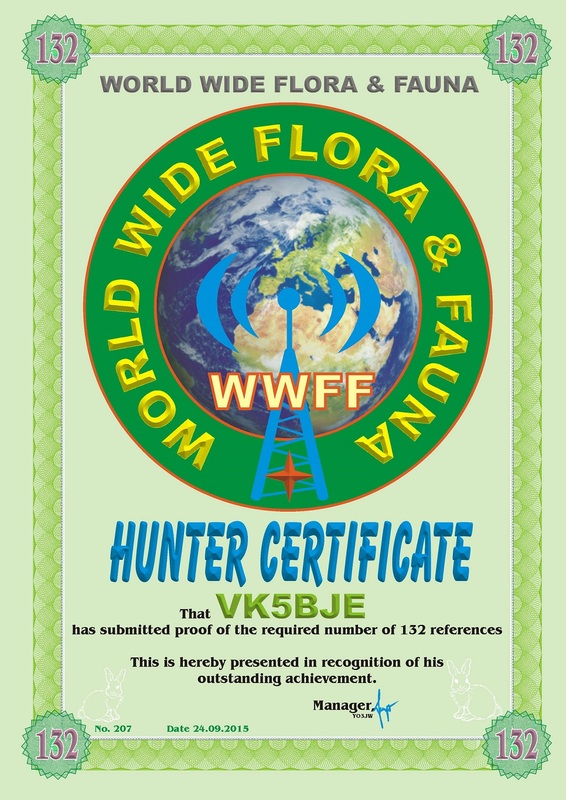 Thanks to all concerned for a most attractive certificate. 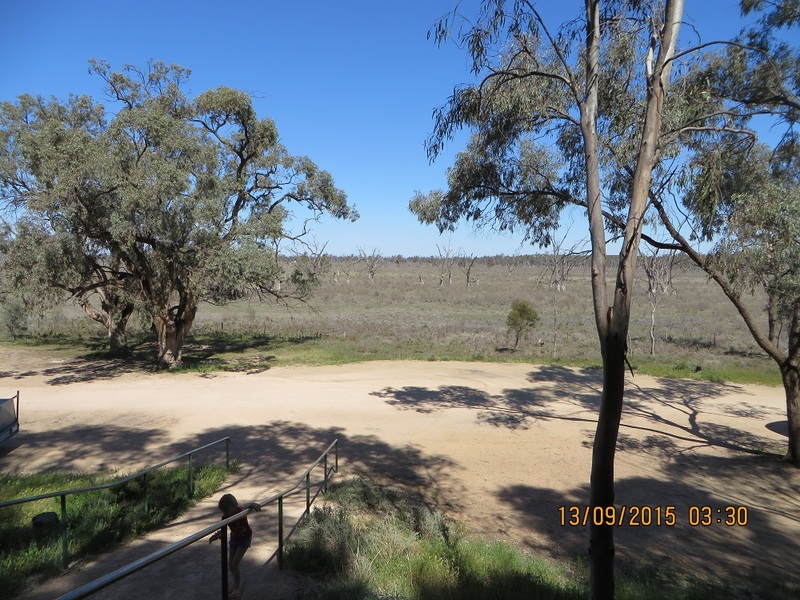 I have previously activated this Park just over two years ago on the 28th July 2013. I succeeded in making 13 contacts and I thought I did really well. It is a tribute to the chasers that 44 + contacts are now achievable at a single sitting. Here is a link to that activation. On this occasion I began my activation just after UTC rollover at 00:03 and finished at 04:39 (my last contact was with Rick, VK4RF, and we spent 26 minutes in our qso on 20 metres). Signals were 5 and 9 each way and I was using 10 watts. 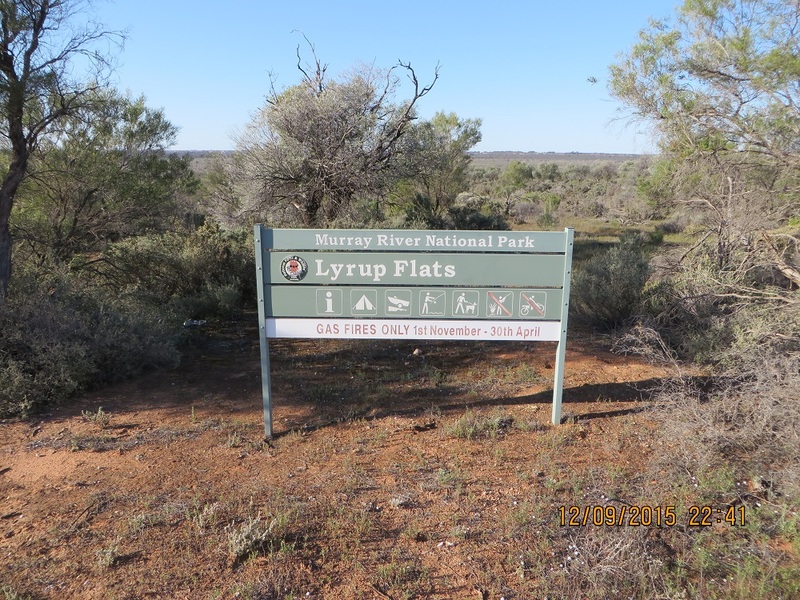 Here are my contacts: on 7.095, VK3XCO/P2, Peter at West Wyalong; VK3DQ, John; VK3FPBI, Allan; VK6ADF/P6, Allan on SOTA summit VK6/SG-011; VK3DBP, Paul; VK3PRF/M, Peter at Bairnsdale; VK2IO, Gerard; VK3XCO/M2, Peter informing me of his progress in travelling to Victoria; VK5FAJS/P2, Allan at Bournda National Park; VK3AW, Laurie; VK3PMG, Mick; VK2PDW, Wayne; VK2XXM, Robert; VK5ZGY/M, Greg; VK3PF, Peter; VK3HP, Grant; VK4AAC/P5, Rob; VK5GJ/QRP, Greg in the Adelaide Hills; VK5NFB, Don; VK3YFL, Brian; VK3DPG, Dennis; VK5GI, Norm; VK3RV, Peter; VK3DBP, Paul; VK5KBJ, Barry; VK5IS, Ian; VK5FANA, Adrian; VK2MTC, Greg; VK5YX, Hans; VK3BGE, Ian; VK5KKT, Ian; VK5FAJS, Allan at Bournda National Park; VK5ZRJ, Bob; VK5YX, Hans; VK2XXM, Rob at 02:31; VK2XXM, Rob at 02:42 on 14,305; 7.095 VK5PL, David; VK5WG, Nev; VK3MRO, Tibor at Shepparton; VK5NAQ, Peter; VK2HEW, ‘Hewie’; VK3ZPF, Peter; VK2YW, John; VK5KLV, Les; VK3ALB, Lou; VK3FBNG, Bruce; VK7FMPR, Mark; VK3XCO/M3, Peter now in VK3; VK5NM, Rick; VK3AMX, Alex at 03:46. 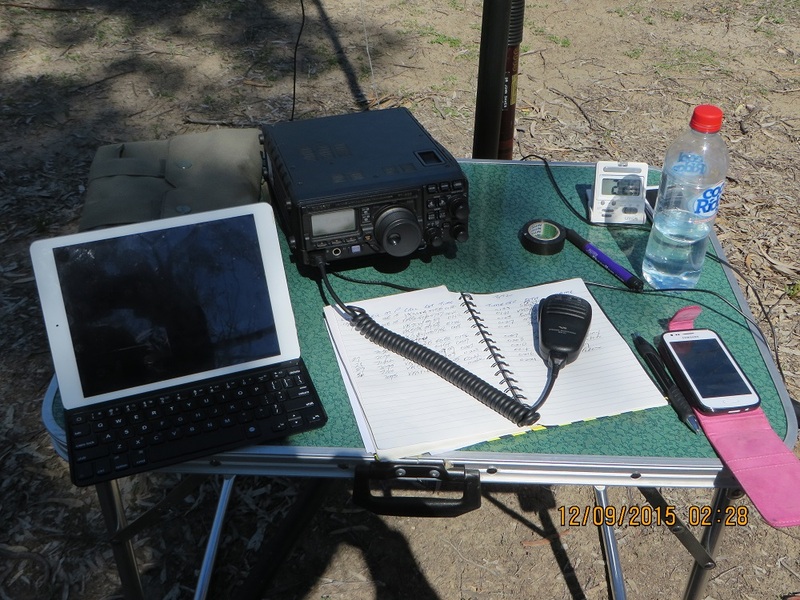 I then moved again to 20 metres and on 14.300 worked VK4GFS, George at Toowoomba; on 14.310, VK4RF and VK4HA, Rick with sign off at 04:39. I succeeded in making 44+ contacts and as per usual, thank all of the operators who gave me a call. Such calls are always greatly appreciated. 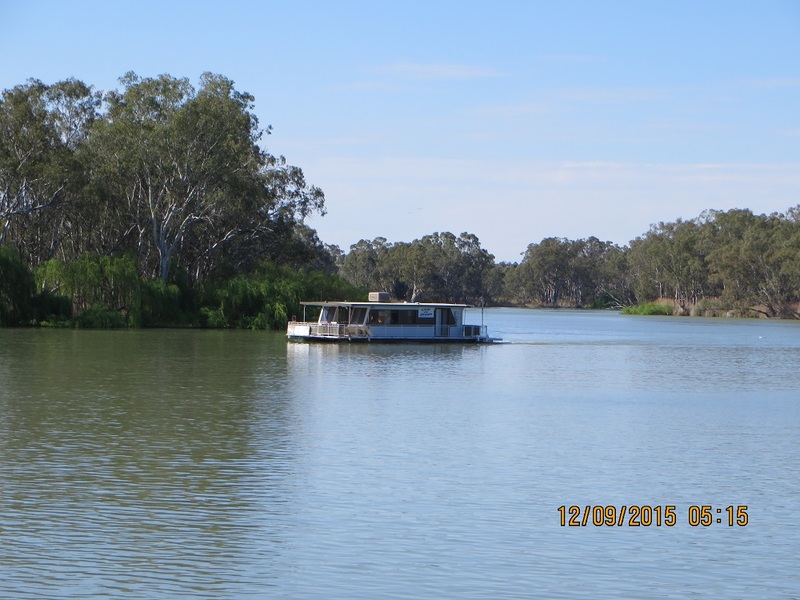 We drove from Renmark to Waikerie on Monday 14th September. 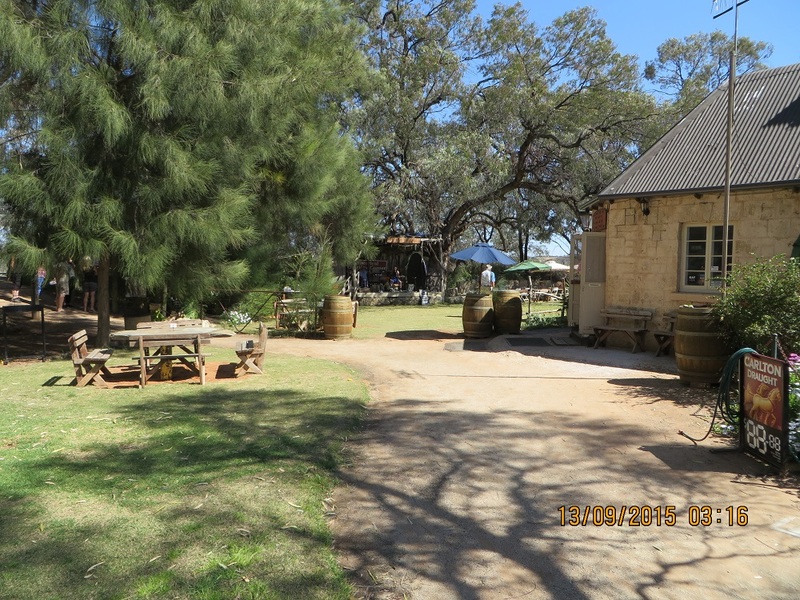 On the way we stopped at the Overland Corner Hotel for lunch. This historic hotel is owned by the National Trust and is under lease. I phoned from Renmark and booked and we were given a table outside with some shade. It was a great place for lunch and it was just as well we booked as the place was popular with a tourist coach and other visitors enjoying the beautiful weather. 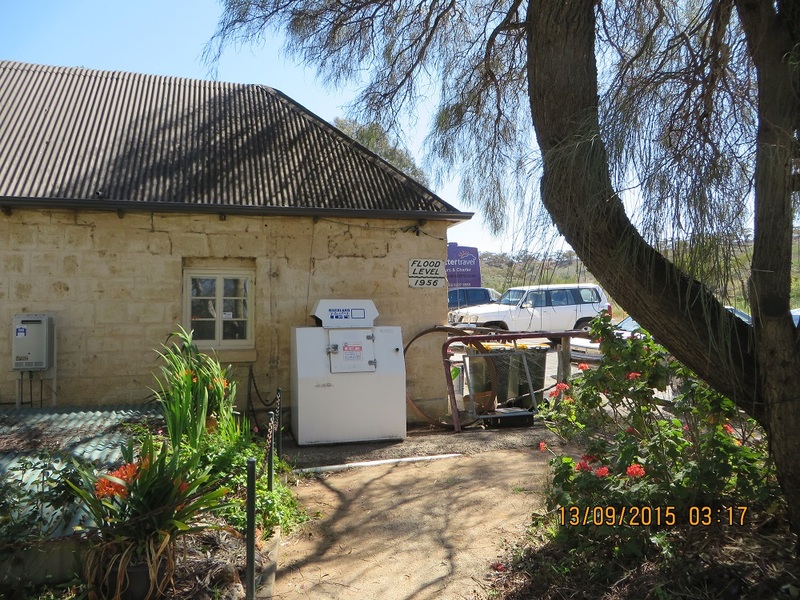 The Overland Corner Hotel showing the 1956 flood level on the wall. After lunch we visited Lock 2 near Taylorville. Here are some photos from our visit. 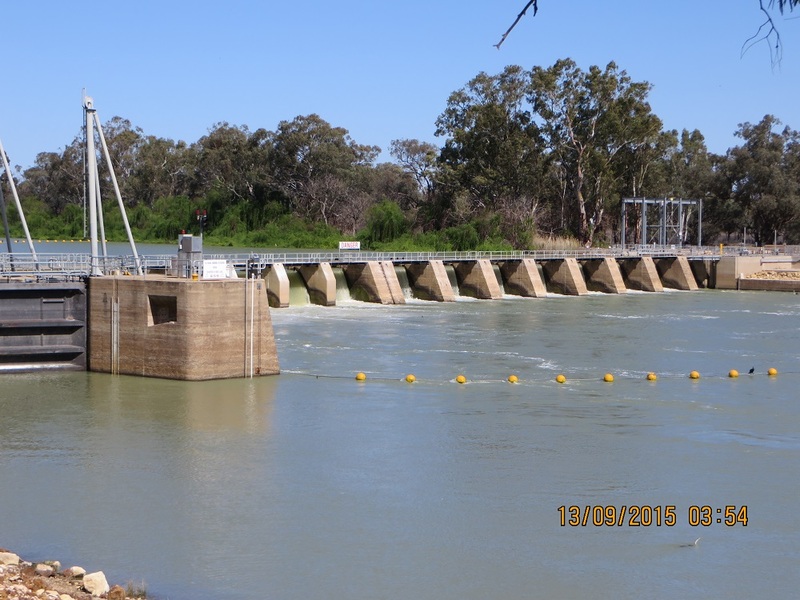 The first photo is of the weir. 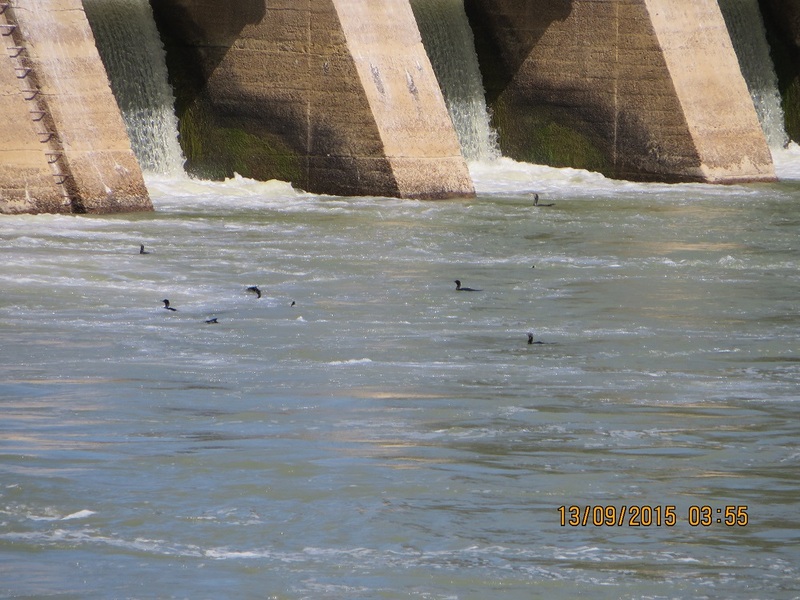 The second photo is a portion of the first showing Darters (also known as snake birds) fishing in the disturbed water just below the weir. 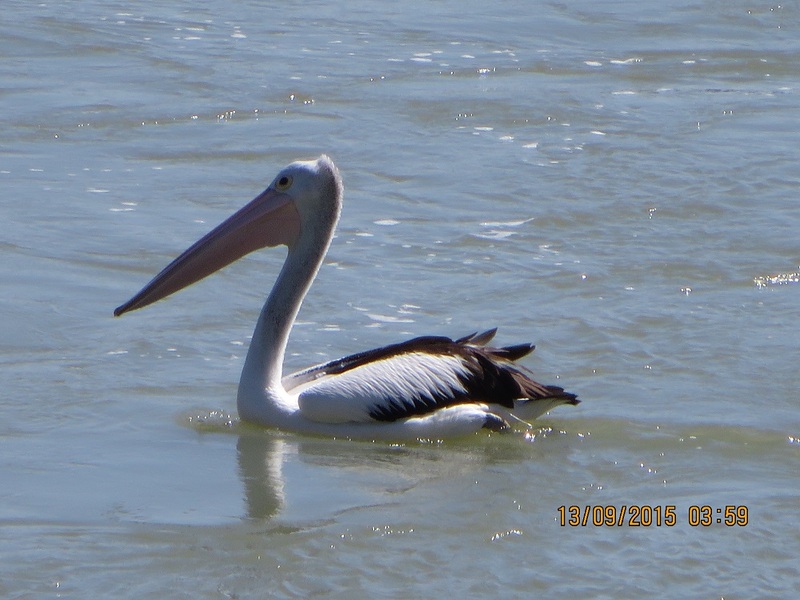 The third photo shows a pelican just outside the really disturbed water waiting for his/her turn at fishing for the ones who get through the gauntlet of the Darters! We stayed on a private property near Taylorville. Our accommodation was a log cottage built into the side of a hill above the flood plain. It was a great place for bird watching. The Noisy Myna is not our favourite bird. They are bullies and displace less aggressive species. However, we were impressed with these birds as parents: they were diligent and worked with apparently little time off collecting food for their young. 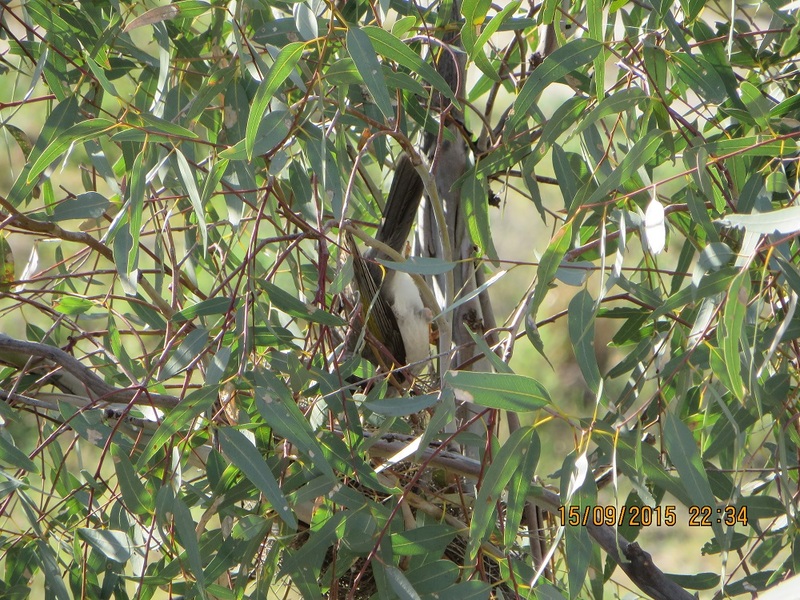 Their nest was in a small tree just outside our accommodation. Here is a photo of one of the parents hanging up side down feeding hatchlings.